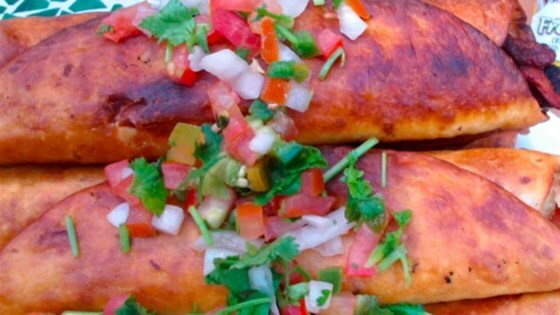 "A unique twist on the rolled taco, these spicy chicken taquitos are quickly pan fried until golden brown. Serve with guacamole and pico de gallo." Mix together Alfredo sauce with chipotle sauce. Add the chicken mix until well blended. Place a slice of bacon on a tortilla. Spoon some of the chicken mixture on the tortilla and top with onion slices. Roll up the tortilla and secure with a toothpick. Fill and secure the other tortillas with the rest of the chicken and onions. Heat oil in a heavy skillet over medium-high heat. Place rolled tortillas in the skillet in a single layer. Fry on each side until golden brown. Brown in batches if necessary. Serve with guacamole and pico de gallo. Consistent family fave. Not exactly low calorie, but a nice treat for the weekend! I substitute enchilada sauce just as a personal preference, but the recipe is great as is. It was okay, kind of a strange flavor with the chipotle & Alfredo mixed together, definitely not the best combination. I didn't really enjoy that. Would not make it again.